This project is what we in the business call ‘going big’. 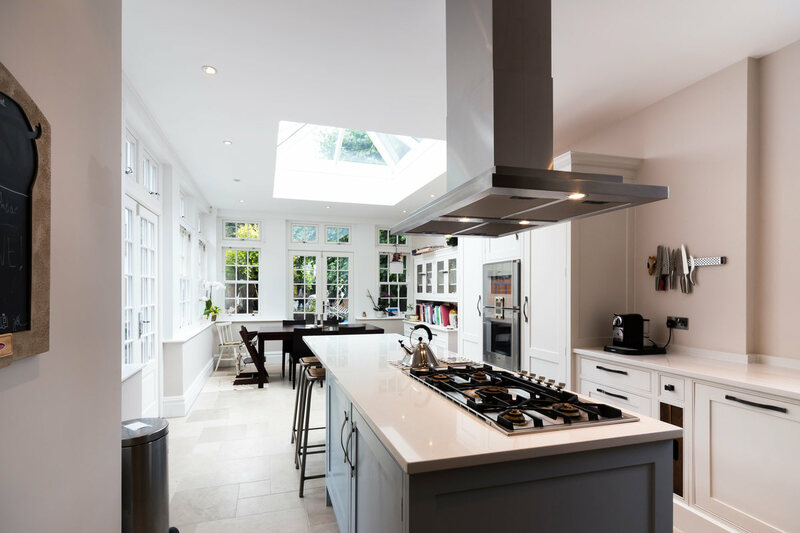 The family, based in Barnes, wanted a full house refurbishment, alongside a rear extension and loft conversion. They wanted to keep their large home’s original features, while utilising the bags and bags of space that was being left unloved. 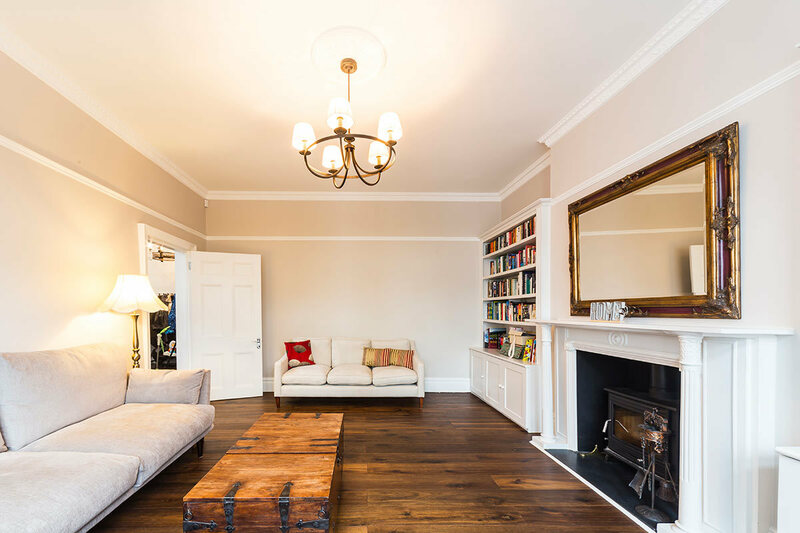 Though this home sits in a Conservation Area, and therefore had external limits, our team was given free reign to transform this space from top to bottom. Needless to say, our team had a lot of fun! Starting at the top, we looked at converting their empty loft space into not one, but THREE bedrooms. 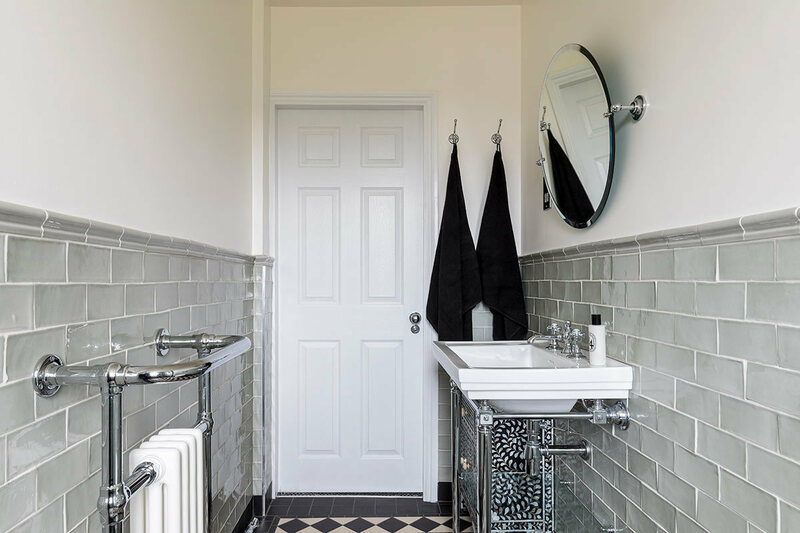 Because this home had so much space up for grabs, the owners were keen that our design created rooms that could work independent of the rest of the house. That’s why we installed a bathroom into the loft, allowing the residents to enjoy this area in private. We also included a separate boiler, plus an independent heating system. 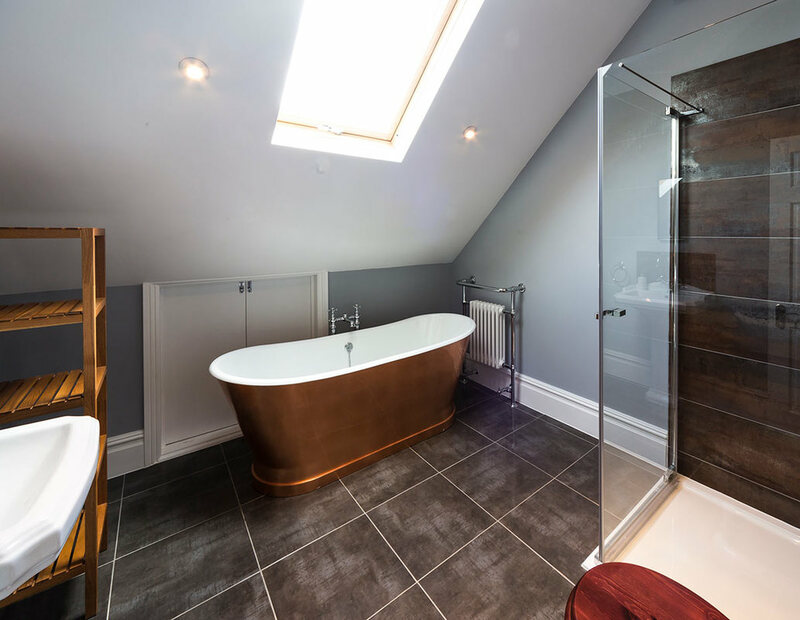 With bathroom skylights, and large double bedroom, this loft conversion created the perfect space for teens, older relatives, or future au pairs. 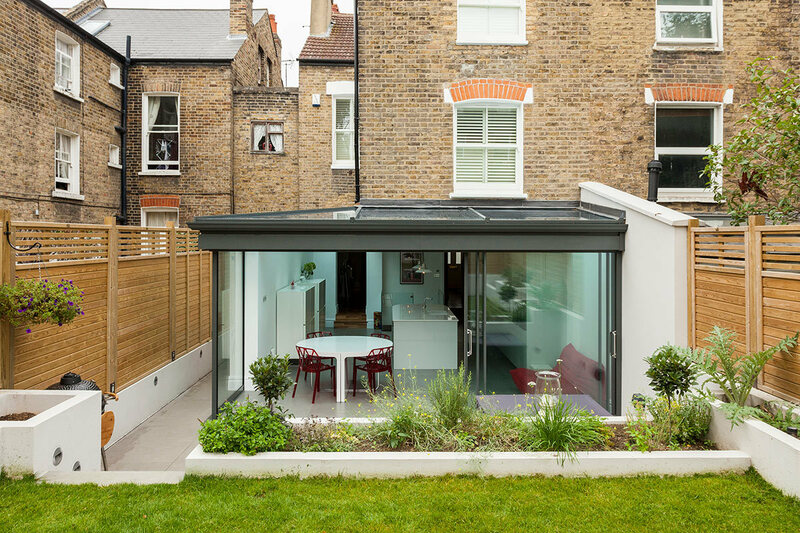 For the ground-floor, we designed a rear extension, complete with a glazed lantern rooflight. 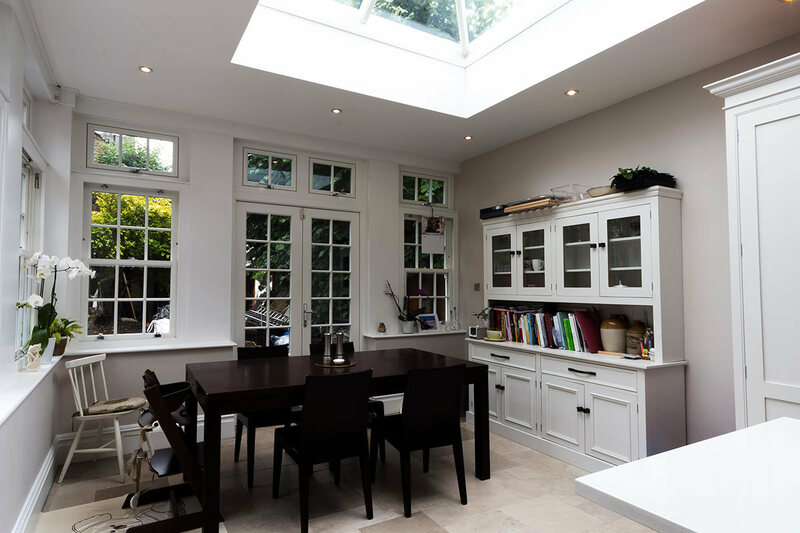 With large amounts of additional glazing throughout, we created a kitchen and dining space that just swims in natural light. 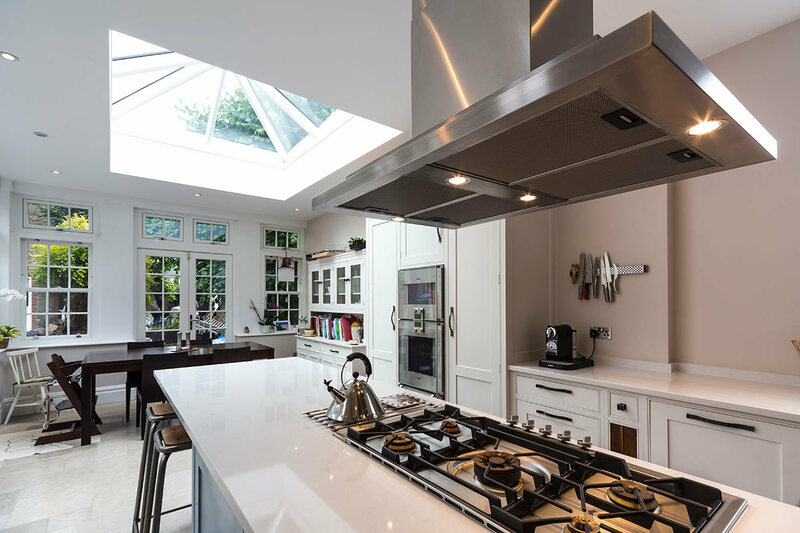 The kitchen island stove allows for plenty of cooking and socialising space, allowing this to become a hub for future dinner parties. We even selected glazed French doors for easy connection to the garden. To achieve more functional space throughout the home, our design included the rearrangement of the existing walls. Knocking down some, and reconfiguring others. This allowed us to provide an impressive lounge area, complete with original fireplace. We also designed a luxury master bedroom with ensuite, and even found room for a library. The whole project was tied together by the couple’s gorgeous taste in finishings, as they added in classic materials and stylish touches of copper. Truly a project our team will never forget!